This is the action movie that Junesploitation would get to see on its birthday. 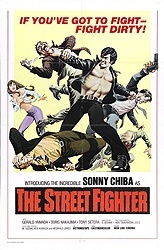 Sonny Chiba made his mark on international film with this movie and its sequels, Return of the Street Fighter and The Street Fighter’s Last Revenge, all of which were released in 1974. Chiba plays Terry Tsurugi, a martial arts mercenary for hire, which doesn’t mean he’s just a duelist or an assassin; we see him rescuing people from prison, and brawling against a veritable horde of gangsters. But don’t mistake his rescuing of people and brawling against criminals as a signal that he’s some sort of good guy; he fights an entire dojo of innocents and threatens to kill bystanders to ensure his escape. He’s brutal, short-tempered, conniving, and unafraid to rip off body parts unless he’s given what is owed. His self-serving impulses lead to some slightly nonsensical switches in allegiance, but the character always feels like his own man, that he’s making the decisions that he wants, rather than being influenced by money or coercion. What I find most interesting is that instead of playing the typical stoic martial arts lead who is impenetrable in emotion and flawless in technique, he completely goes the other way, playing up Tsurugi’s machismo and charisma. He contorts his face in extreme grimaces, pulling his mouth one way or the other, wrinkling his brow and nose as he prepares to fight. It might be tempting to say that he’s goofing on Bruce Lee’s facial and vocal tics (Enter the Dragon released the year before), but I think Chiba’s energy is different. Where Lee plays with the same rage in his roles, he almost always comes off as polished, controlled, and smooth; he never totally sheds his identity of being a martial artist. In this movie, Chiba is much more brutal and manic, seemingly unconcerned with self-discipline or who he hits or how hard he hits them. Terry Tsurugi is not trying to knock you out, he’s trying to take you out, permanently. Speaking of which, the movie doesn’t shy away from showing you Tsurugi’s aggression; it has the distinction of being one of the first with an “X” rating purely for violence, which the filmmakers toned down to an “R” by cutting out 16 minutes. There’s obviously been some inflation in the value of violence between 1974 and now, but there’s no question that Tsurugi’s creatively messy dispatch of his enemies has a powerful effect; the surprising moments of insane violence all point to the character’s furious macho attitude not being fake, but absolutely at the core of who he is, which he also discover the origin of later in the story. As if to emphasize the character’s manliness, Tsurugi is often shirtless or wearing a black gi that shows off his muscular chest; it’s like he’s pushing his masculinity in your face. He’s not interested in finding some inner peace or giving respect to customs like many traditional martial arts protagonists, but getting what he wants, when he wants it. This image of a powerful, self-motivated Asian male untied to traditional structure undoubtedly gained new traction with Bruce Lee’s rise to stardom, but Chiba supplies his variation of that image here. The plot eventually settles on the daughter of a recently deceased billionaire; both the corporate controllers of the billionaire’s fortune and the Yakuza target her for their own aims, and Tsurugi is called in to deal with both sides before deciding to protect the girl for his own reasons, and the blood pours. The fighting consistently remains gritty and realistic, without the flourishes of wirework, speed-ramping, or intricate camerawork, but, interestingly enough, there are still some fantastical parts that feel like they’re taken from a different movie. Tsurugi’s aforementioned ability to rip off body parts doesn’t seem unusual in this type of movie, but it sticks out that he’s the only one who can do something like that. A little further out on the limb is a blind swordsman assassin and a villain boss dressed in traditional Chinese clothes and armed with a short scimitar in a movie set in contemporary times. What are these two remnants from more traditional kung-fu movies doing here? Quentin Tarantino is well known for his love of The Street Fighter and its accompanying iconography, casting Sonny Chiba in Kill Bill and having Christian Slater and Patricia Arquette sit through a Sonny Chiba marathon in True Romance. His affection for the movie, including naming it one of his top 20 grindhouse classics, has kept it on the map for a contemporary audience, which is a place it fully deserves for its badass star turn of Sonny Chiba and its highly entertaining grindhouse aesthetic. This flick is AWESOME. Sonny Chiba will always be one of the finest actors working in martial arts films today. Of the many gifts True Romance gave me, this was the most unexpected, and one I'm very thankful for. I think Streetfighter was the film to really kick off my love of martial arts movies! I remember randomly picking it out of the discount bin, bringing it home, and being blown away by how colorful and over the top the movie was. Awesome article! Not only is that me agreeing but also my impression of a kid in every 80's and 90's commercial for board games. 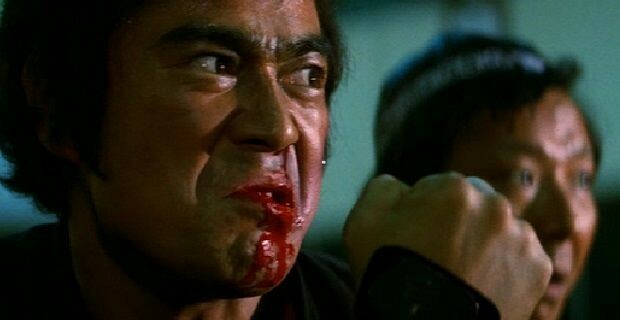 Sonny Chiba is my fave. I love Street Fighter. 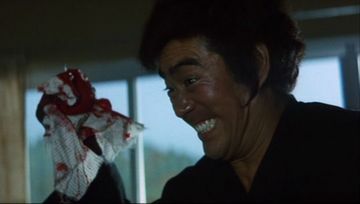 Sonny Chiba doesn't fight dudes he destroys them. Tsurugi doesn't give a you know what about anybody. Great write-up Mark. You neglected to mention the ridiculously funky Street Fighter theme music. Just thinking about it makes me want to rip out a dudes larynx.